Today, we feature one of the most important anthologies ever published. Not only is it entertaining as hell, it breaks new ground in that it features AFRIKAN women in the role of heroes in African-inspired stories of Heroic and Epic Fantasy! Griots: Sisters of the Spear picks up where the ground breaking Griots: A Sword and Soul Anthology leaves off. Charles R. Saunders, the Father of Sword and Soul and Milton J. Davis, the Godfather of Sword and Soul, present seventeen original and exciting Sword and Soul tales focusing on Black women. 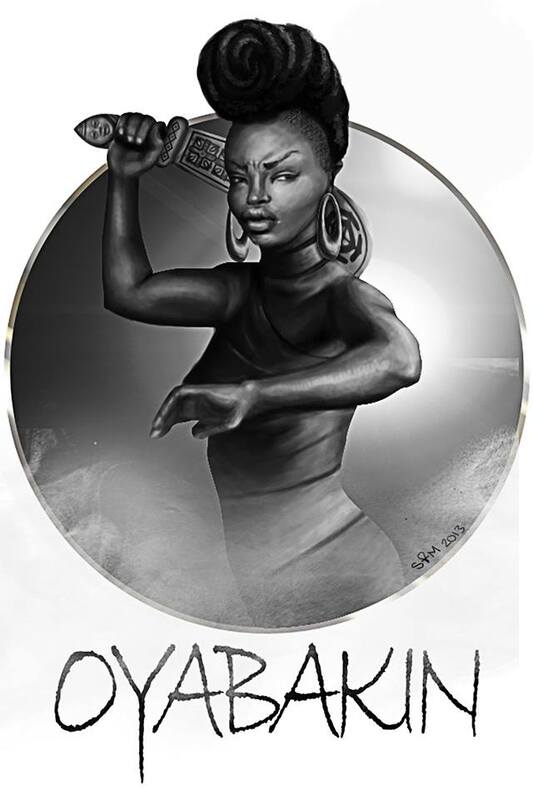 Just as the Griots Anthology broke ground as the first Sword and Soul Anthology, Griots: Sisters of the Spear pays homage to the spirit, bravery and compassion of women of color. Seventeen authors and eight artists combine their skills to tell stories of bravery, love, danger and hope. 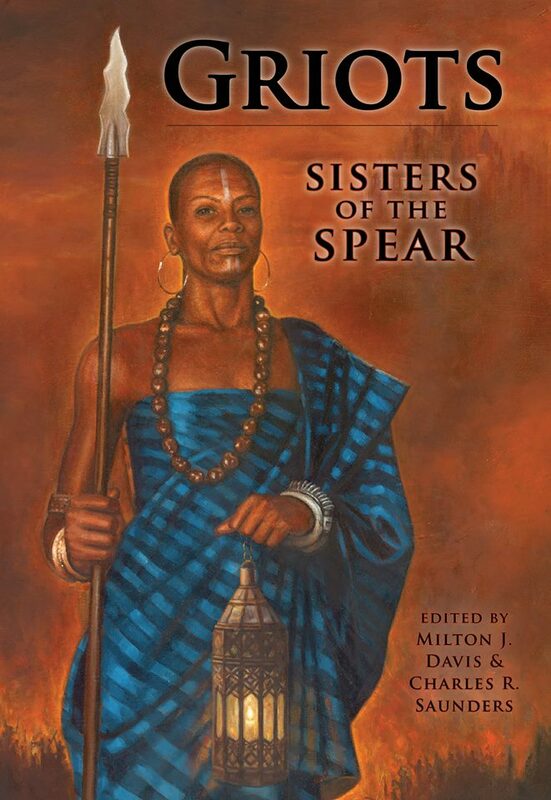 The woman in Andrea Rushing’s evocative painting that graces the cover of Griots: Sisters of the Spear symbolizes the essence of the anthology. Although the painting is not a direct depiction of any of the characters in the stories, the spirit of this woman imbues all of them. She is a teller of truth, and a slayer of stereotypes. As is the case with black men, black women have been subjected to invidious stereotyping for centuries in real life and fiction alike. For the most part, these characterizations have ranged from the condescending to the downright hostile – from the faithful “Mammy” of Gone with the Wind to the scornful “Sapphire” of Amos ‘n’ Andy to the degraded “Ho” made infamous in all-too-many rap-music lyrics. The fantasy-fiction genre is no exception. Until recently, black women have been either non-existent, or portrayed in ways that made absence the preferable alternative. Real life defies the stereotypes. Throughout history, there has been no dearth of strong and courageous black women who have stood alongside – and sometimes in front of – their men and children during the course of a 500-year-long struggle against oppression in Africa, and the places in the rest of the world to which Africans were taken against their will to fuel economies with their forced labor. A few examples: The Candace, or queen, of Kush defied the legions of ancient Rome. Queen Nzinga of Ndongo in central Africa fought to protect her people from the depredations of European slavers. Harriet Tubman risked her life to lead slaves to freedom in the years before the U.S. Civil War. Fannie Lou Hamer endured vicious physical abuse from the authorities in her non-violent quest to win basic civil rights for black Americans. Women such as these – and many more like them – stand as living contradictions to the misrepresentations that persist to this day. So do the women in Sisters of the Spear. When Milton Davis came up with the idea of a woman-themed sequel to our first anthology, Griots, I co-signed immediately. Like Griots, Sisters of the Spear presents an opportunity to bring more black representation to a genre that’s still in need of more color. Thanks to Griots, we knew there were more than a few writers and artists of all racial persuasions who would embrace our theme of powerful black womanhood and create stories and illustrations that would be excellent by any standard. Our expectations have been more than fulfilled. Our modern-day griots came through with – not to belabor the point – flying colors. The fictional warrior-women and sorceresses you will meet in the following pages can hold their own and then some against the barbarians and power-mad monarchs and magic-users of both genders who swing swords and cast spells in the mostly European-derived settings of modern fantasy and sword-and-sorcery. The reach of sword-and soul has expanded greatly with Sisters of the Spear. It’s time now to allow the woman on the cover to serve as your guide through the anthology. The light she carries will illuminate the truth that is always inherent in the best of fiction. And her spear will slay the stereotypes. Posted by Balogun on April 25, 2014 in Adventure, Afrofuturism, Dark Fantasy, Fantasy, Short Story and tagged charles saunders, epic fantasy, sword and soul. I love Sisters of the Spear. It makes me so glad. Some criticism I saw for the original Griots was that there were so few stories about women in it. Sisters of the Spear is the perfect response. I’m glad you enjoyed Sisters of the Spear, Fujimoto!